The most complicated part of this dish is making the Dukkah Spice Mix - once you have a jar of that in your pantry, you can whip this meal up in about 45 minutes or less, and you can even keep the prepared ingredients on hand if you'd like to make this a fast breakfast dish. All you'd need to do is heat up the lentils and tomatoes, poach an egg, and top with Dukkah. 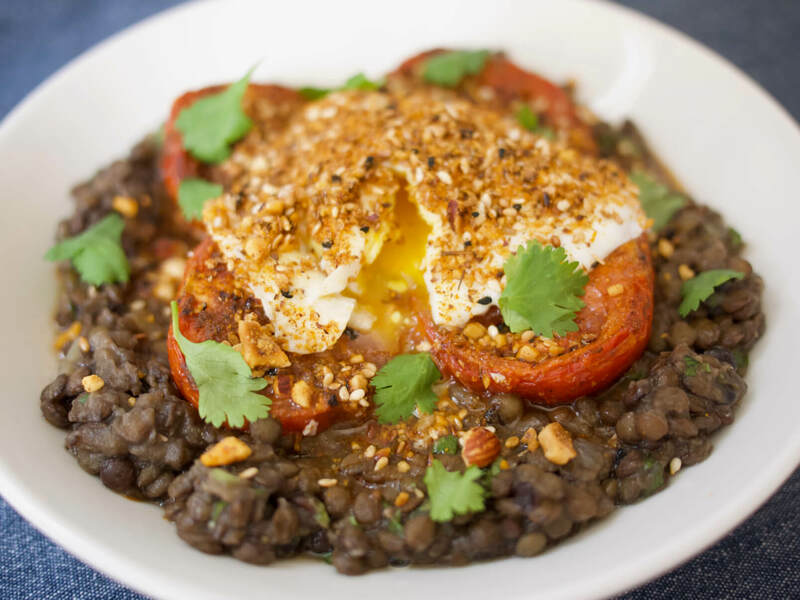 But this is more than a breakfast or brunch dish - it also satisfies as a vegetarian main, with its bed of earthy lentils tossed in a sharp vinaigrette, tomatoes tossed with earthy Vanns Harissa and slow roasted, and that perfect self-saucing egg on top. But it's the Dukkah that really brings it all together, the crunch and the flavors of the spices marrying all of the flavors together into a dish that you'll be happy to eat at any meal. Before you get started, make sure you have your Dukkah Spice Mix all prepared, as it takes a bit of time to pull together! To make the tomatoes, heat the oven to 375°F. Place the ahlved tomatoes in a large bowl and toss with the olive oil, harissa, and salt, using your hands to evenly coat each tomato. Arrange the tomatoes, cut side up, on a rimmed baking sheet and pour any spices and olive oil left in the bowl over the tomatoes. Roast until caramelized in spots and slightly shrunken, about 45 minutes. While the tomatoes cook, make the lentils. Heat 1 Tbs. of the olive oil in a medium saucepan and add the onion and celery. Cook until softened and translucent, but not browning, about 5 minutes. Add the garlic and saute until fragrant, 1-2 minutes. Add the lentils, thyme, and bay leaf, and stir until coated in the oil. Add 3 cups of water and bring to a boil, then reduce to a gentle simmer until lentils are tender, 15-25 minutes. The best way to check for tenderness is to remove a few lentils from the pot, allow them to cool, and taste for texture. They should be soft and creamy but not mushy or falling apart. Drain lentils of any leftover liquid and remove the bay leaf. Stir in lemon juice, vinegar, and 3 Tbs. olive oil. Season to taste with salt and pepper. When tomatoes are about 5-10 minutes away from being done, start the egg poaching process. Heat 3 inches of water in a saucepan until boiling, then reduce to the slightest simmer. Tiny bubbles should barely be coming up to the surface. While water is heating, spoon the lentils out into serving dishes or bowls and top each one with 4 tomato halves. You want the plates to be ready when the eggs are done! Crack the eggs into a bowl, taking care not to break the yolks. When water is at a low simmer, gently pour the eggs into the pan, aiming to drop one in at a time. Set a timer for 3 minutes and 30 seconds. After a minute or so, you can gently lift the eggs up from the bottom of the pan with a slotted spoon to improve their shape, if desired. If you’re a nervous egg poacher, just let them be! After 3 minutes 30 seconds, lift one egg out of the water to see if it’s done. If the egg is very wobbly in the spoon, let them cook another 10 seconds or so. Repeat the process until the whites are fully set, but the yolks are still soft. Turn off the heat and use a slotted spoon to drain each egg of as much water as possible before transferring to bowls. Sprinkle each egg with a generous pinch or two of dukkah and a sprinkle of cilantro leaves and serve warm. Serves 6. Adapted from Diana Henry.